Goto to settings and add a new Locale for ex. Persian. Goto to Channels and make a new channel or edit the active one, there you have to select Persian in locales and save the or create a new channel with it. See the image below it is a product form. Right after where Edit Product's heading there are two select fields the first one is for selecting channel and second one is for selecting Locale. The presence of these two fields at the start indicates the values of that or in this case 'Product' is dependent on Channel and Locale both. In the picture above i have marked two things one are Channel and other is Locale which is directly above on the right of field 'Name'. This indicates that the field Name's value is dependent on channel and locale both which provides you to add support for Persian language. You have to concern about the values of products and categories because the of both these things are channel and locale dependent both. Please go on if you have more problems regarding translations. For all other strings that need to be translated to the locale the user switch from the store front. Create lang file in like locale_code.php , locale_code here is the code that you have entered when you created a new locale and by default 'en' locale file is present inside the shop/resources/lang/ and admin/resources/lang/ packages directory inside packages/webkul. Make a new file to see completely translated text on your. You need to create the folder of same locale_code and file inside it with the same locale code. 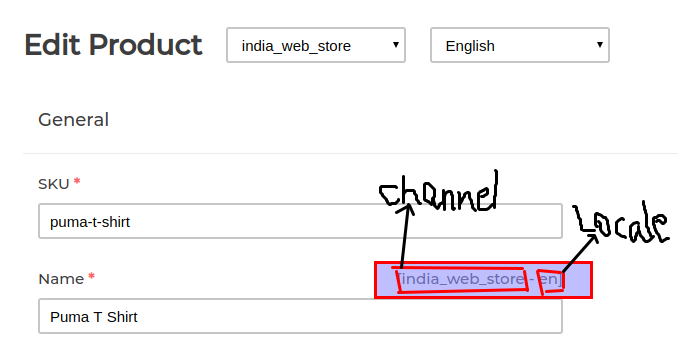 And enable that locale in channels as default locale or select multiple locales in the channels.